November 26th: Before we even left NYC, Great White Shark diving was on my list of out of budget expenses I would like to do, it is one of the must do activities in South Africa and if you have the chance to get yourself into the heart of Shark territory then the place to go is Gans Baai a.k.a ‘Shark Alley’. This coastline is also famous as the Whale coast. In season people flock to the area to Whale watch the Southern Right Whale were in hangs out before summer comes and it moves south into the Antarctic waters. So we were in for a double treat whilst we were there. 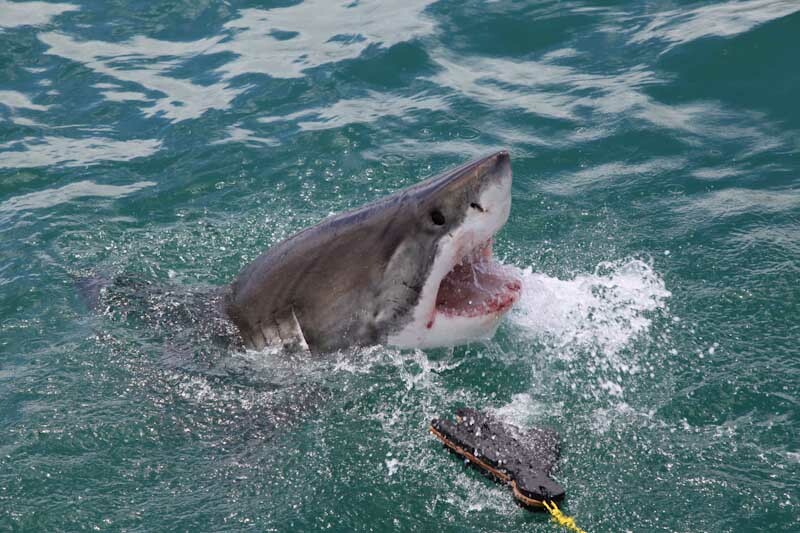 But first to the sharks, the idea of Shark diving is like being on a safari and it aims to change people’s perceptions of Great Whites especially after the film Jaws came out and also give the more adventurous ones an opportunity to come face to face with these fantastic animals. 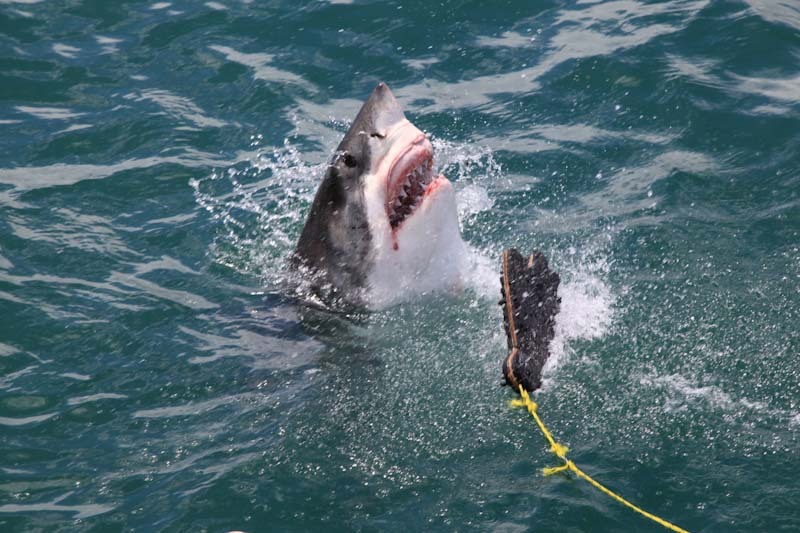 The concept of Shark Diving is pretty simple and there are simple steps to follow. 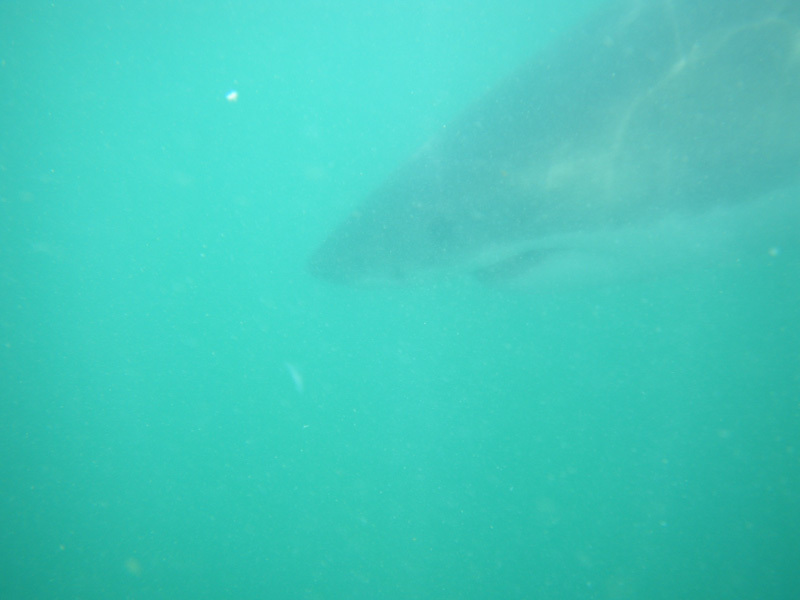 First up get on a boat, secondly get in a Wetsuit, thirdly get in the cage in the ocean and finally await the Sharks! 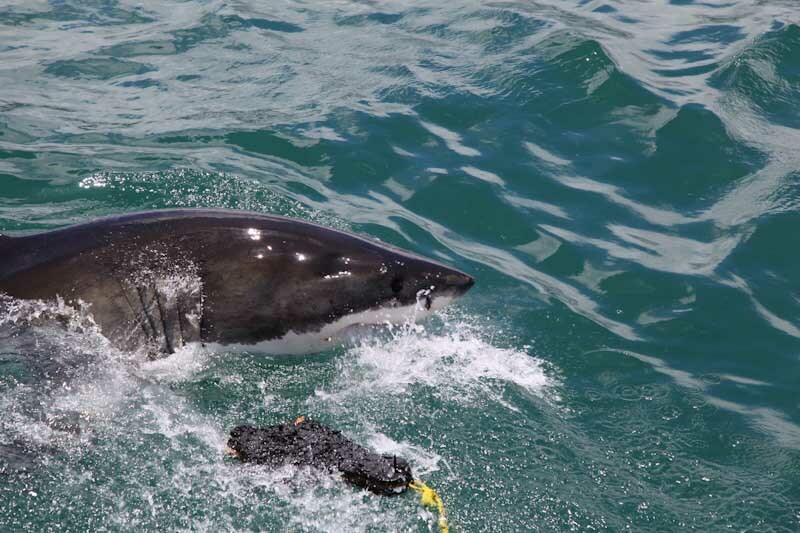 Now the Sharks do not necessarily just turn up where we are so the boats use fake seals made out of the same stuff as swimming floats and also chum and half chunks of Tuna to bring the Sharks in close. 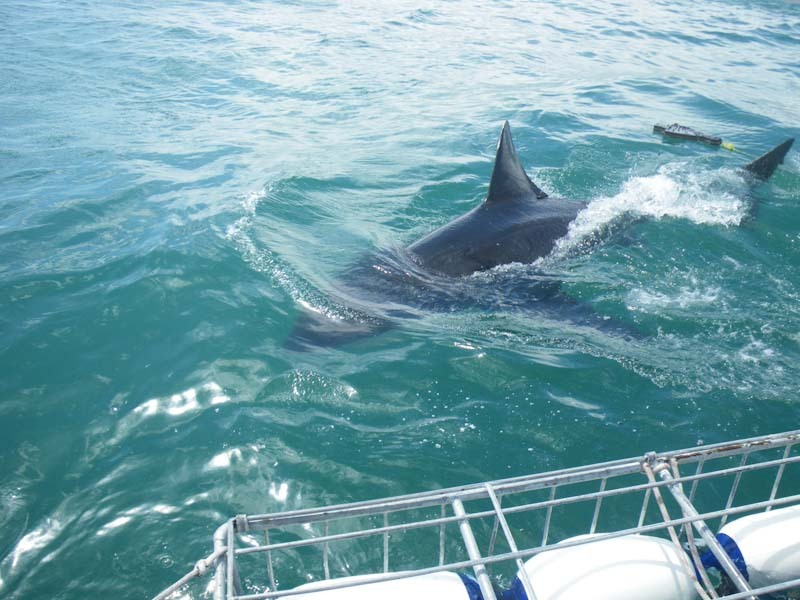 So with this in mind the scene is set up and we get the first shout of the day ‘shark, starboard side coming from the left’ and there it was coasting through the water investigating what we were. With that the first divers went in the cage, which you can just see in the bottom of the photograph below, and they started the experience watching the Sharks as they cruised by the cage, here a metre or two out but still close enough! The underwater visibility was not great, but from on top of the boat one got a great perspective of the size, power and movement of these impressive animals! 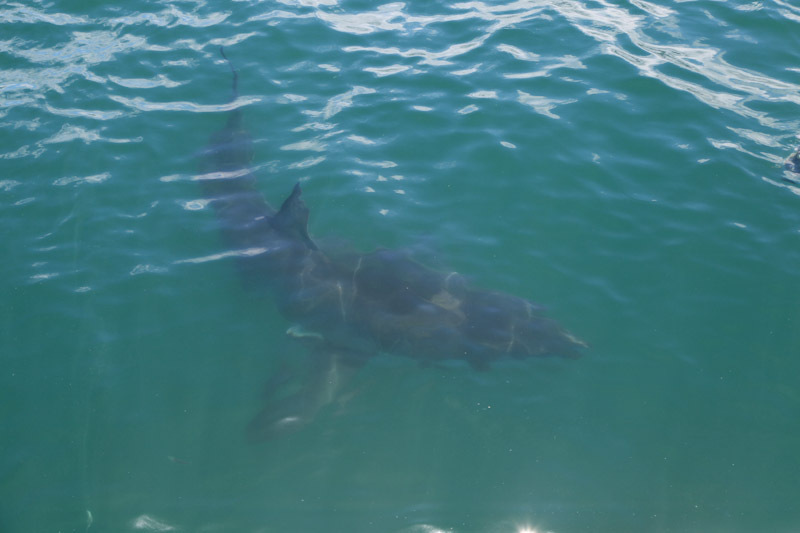 It was finally time for Steph and I to go in the cage, now I am not going to lie, one gets very nervous when one is about to through oneself off a perfectly good boat into a floating cage in the ocean to confront a Great White Shark! But there was no messing with this crew before you knew it we were being assisted down into the cage. First thought….it was f****** freezing!! Second thoughts…keep all extremities in the cage!! We enjoyed a Fantastic afternoon watching these animals both from the boat and underwater and there were a couple of special occasions when we got to see some of the power and agility of these magnificent animals! After we had survived Jaws and before we left Gans Baai, we decided to head back to De Kelders where we had stayed the night before to see if we could see any whales. Now if you know our story of whale watching in New England a few years back, you know full well the chances we were going to see whales was about 6%! Now we had popped by in the morning and seen a few just floating 50 metres from the shore, but there was not breaching or tale flipping going on. So we went back to see if there were any developments. 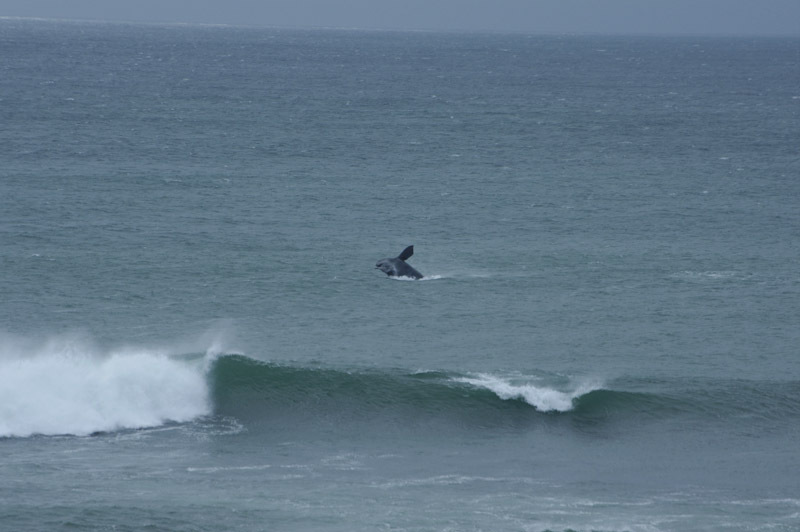 When we arrived at the spot by the rocks we started spotting whales dotted around the bay, maybe about 4 groups of about 7 or 8 whales which was great. Whilst we were watching a couple about 100 metres from the shore, I thought I saw a whale breach, I yelled at Steph and rubbed my eye’s…again it breached, this was amazing, it was a ways away but we watched one whale chase the other and it continued to breach and jump for about 30 secs or about 100 metres, it was like watching Free Willy!!. It was great amazing to see, the photographs do not do justice to what we witnessed but you get the idea. We also saw another group of the Whales doing the take flips but none were the money shot, mostly they were from a side angle or just playing and making there tale glide through the water looking like a Shark!